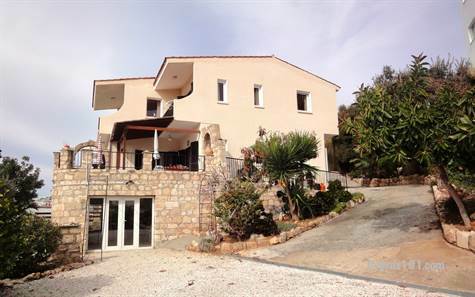 Cyprus Property Blog by Cleo : Exclusive & Just Listed - Character Villa in Peyia - Must be seen! Peyia, Paphos - This custom built family home is situated on a large plot within easy walking distance to the popular village of Peyia. Coral Bay known for it’s sandy beaches and crystal clear waters is a few minute’s drive away. The property features a covered porch leading to a large inner hallway with guest cloakroom and useful storage space. To the front is a spacious living room with stone feature fireplace and cast iron gas fire. To the left, a good size dining room and separate fully fitted kitchen with cherry wood units. On the first floor are three good size double bedrooms. All have fitted wardrobes and two have a built-in dressing table. The master bedroom has a modern shower room including fitted cupboard and vanity unit and there is a stylish bathroom accessed directly from the landing. The master and second bedroom have private balconies, enjoying the same stunning views as those from the lower level. Steps lead down from the property to the landscaped gardens and pool terrace with pergola to the side. Again the views from here are wonderful. The plot is designed with low maintenance in mind, and for such a sizeable plot, there is very little to do. The property is accessed via a long driveway which leads down to a large turning/parking area and an integral garage which is currently utilised as an art studio and utility/workshop space. It has been extensively refurbished by the current owners and is ideal as a permanent or holiday home. Furniture is included and there are full title deeds.